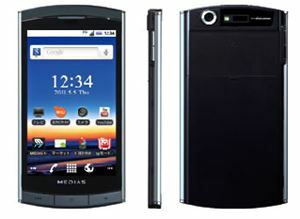 Not to be left out of Android smartphone market, NEC has unveiled its new Android smartphone which is named as NEC Medias N-04C. The new NEC smartphone is the world’s thinnest Android smartphone with only 7.7mm thick. The power of the smartphone is booted up by 800MHz processor and runs on Android 2.2 Froyo operating systems. To prevent from scratches and damage, the display of the NEC Medias N-04C has been covered by Gorilla Glass. Featured with a 4-inch touchscreen display which operates in 854 x 480 resolutions, the NEC Medias N-04C is also equipped with 5.1-megapixel camera. It boasts with GPS, integrated TV tuner, supports Wi-Fi, GSM and Adobe Flash 10.1, comes with a battery that provides up to 250 minutes of talk time and up to 360 hours of standby time. It is Bluetooth enabled and supports up to 32GB of microSDHC memory card. The NEC Medias N-04C with dimensions of 127 x 62 x 7.7mm and weighs 105g is expected to be available in Japan on 15 March via NTT DoCoMo.